New Ground MF Grooving Insert. 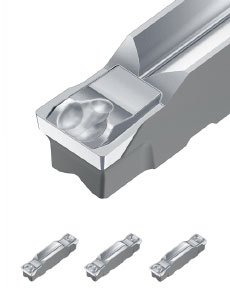 One insert can perform internal, external and face grooving applications. Offered in four grades for a wide variety of materials. Excellent chip control as compared to a molded insert. Efficient chip control when cross-feed machining. Widths to handle ranges from .079 inch/ 2 mm to .250 inch / 6 mm. Grooving applications when chip control becomes an issue. Snap ring groove applications with special width dimensions. Where multiple inserts are needed for external, internal and face grooving. Gummy materials where breaking chips are a problem. Any grooving application where you require improved surface finish. MF gives excellent surface finish compared to M class insert. Ground design for better chip control than M class inserts. MF design works for internal, external and face grooving applications with one insert. MF design offered in 4 grades: uncoated RT9010, uncoated cermet NX2525, and PVD coated grades VP10RT and VP20RT for a wide variety of grooving applications. Width ranges from 2mm / .079 inch to 6 mm / .250 inch for your grooving needs.